Sneakers go home Vulladi Girl brand. Great house slippers to give your daughter a very fashion while creepily fun touch. These shoes go home Vulladi are a good option to keep your feet comfortable and very calentios harsh winter to combat child. 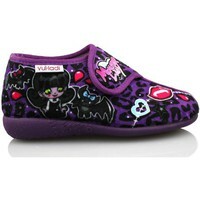 Its mix of purple and black colors give these shoes go home an incredible and fun personality. It is decorated with a very nice vampire girl.